The federal government recognizes that persistent and complex social problems which particularly affect Indigenous people, seniors, youth, immigrants, and wome n, require new and innovative responses. With a social innovation and social finance strategy, the government wants to provide better support for community organizations working to achieve positive solutions to entrenched social problems, including those faced by vulnerable populations. The policies and initiatives that will emerge from the strategy will likely shape the federal government's support for social enterprise and community investment for years to come, so this is an extremely important opportunity. Come hear the latest on progress to date and provide your input so that the strategy, which is due to be announced in Spring 2018, will build on the community-led innovation for shared prosperity that is already happening across the country. 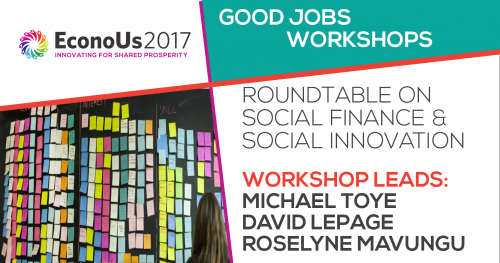 Join us and register now for EconoUs2017!